North Queensland Conservation Council (NQCC) will today be filing its legal challenge to the Great Barrier Reef Marine Park Authority’s (GBRMPA’s) decision to grant a permit for the dumping of 3 million cubic metres of dredge spoil in the GBR Marine Park and World Heritage Area. The application will be filed in the Administrative Appeals Tribunal in Brisbane under the Environment Protection (Sea Dumping) Act 1981 by lawyers from the Environmental Defenders Office Queensland (EDO) acting for NQCC. 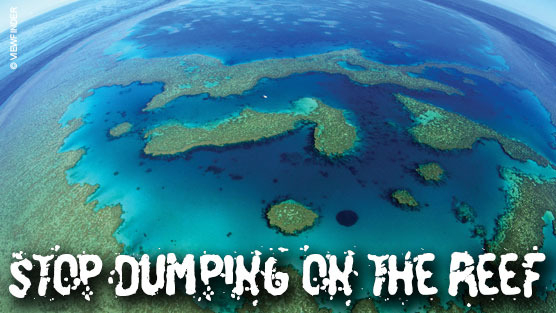 ‘We are proud to be leading this fight on behalf of so many who share with us well-founded concern about the impact of the dumping on the precious World Heritage listed Great Barrier Reef’ said NQCC Coordinator Wendy Tubman. ‘With GBRMPA, and Federal and State governments determining only last year that the condition of the inshore GBR World Heritage Area south of Cooktown is ‘poor and declining’, this decision to allow the dumping of dredge spoil is shocking and bewildering. ‘NQCC has been working with the Environmental Defenders Office Queensland for some time now on the off-chance that a permit would be granted. We will now be presenting that case in court. The application will be filed at 1pm at the Commonwealth Law Courts Cnr Nth Quay & Tank St BRISBANE. Spokespeople available for comment thereafter at Tank Street Entrance.